Mike Slater loves Mozambique. He loves it so much that, over the years, he’s become quite the travel authority on the region. 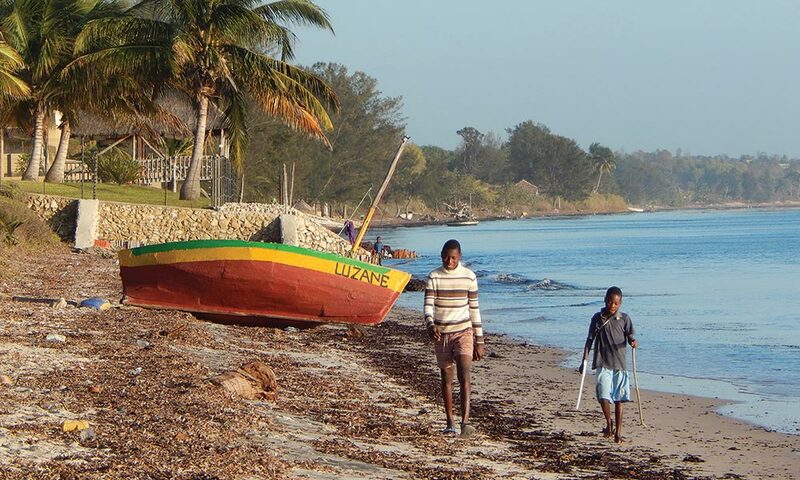 Recently, Mozambique has received a lot of bad press, including from us, with corrupt officials and a rebellion (and armed clashes) in the north of the country keeping tourists away. Mike decided to head over there to see how bad (or good) things really are. For quite a while, Google alerts for “Mozambique” have been filling my inbox with worrying stories about Renamo attacks on armed convoys, shady government deals and corrupt traffic cops who bully tourists into handing over money for real and imaginary offences. I have never allowed my decisions about where to travel to be based on the opinions of a few doom-mongers or the popular press. My hunch that Mozambique is still a land of sunshine, sea and smiles was proven correct during this trip many times over. 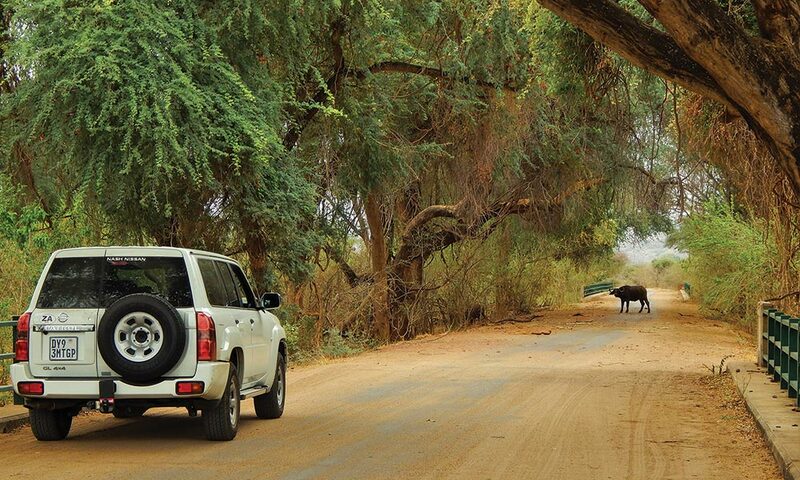 Despite the inconvenience of having to join one of the convoys, I had every intention of heading as far north as Gorongosa National Park one of the great success stories to come out of any African country over the past decade or two. However, because I had only 10 days to travel, I was forced to stick to Mozambique’s interior and coastline south of the Save River. Having grown up visiting unfenced wilderness areas, I usually avoid managed parks and reserves where the list of rules is longer than a gemsbok’s horns; and those just to protect the animals and plants from us idiots. Recent trips to the Kruger Park have opened my prejudiced eyes to what a fantastic place it actually is. A stopover here has become the norm on my way to Mozambique, or when I just need a break from the city smoke in a place where the loudest sound is the hissing cicadas in a mopane tree. I have lived long enough to develop some of my own ideas about how this lonely planet of ours really rolls. 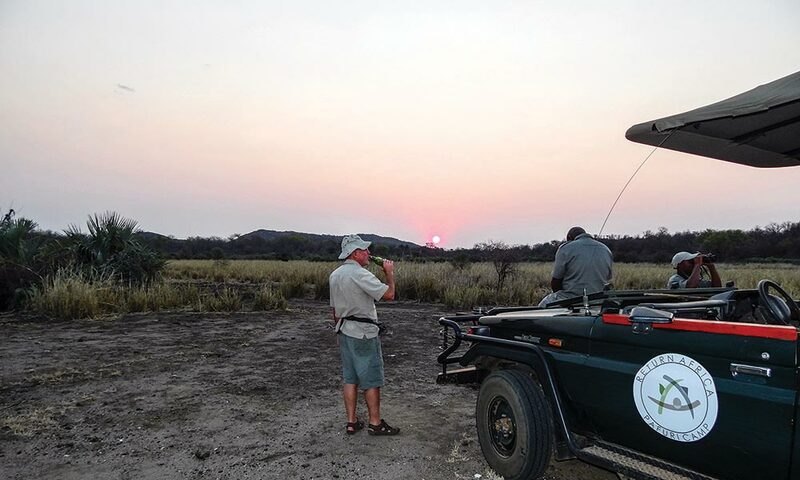 Every place has its secret and in the Kruger National Park, the Makuleke Conservancy is just that – a stunning surprise. 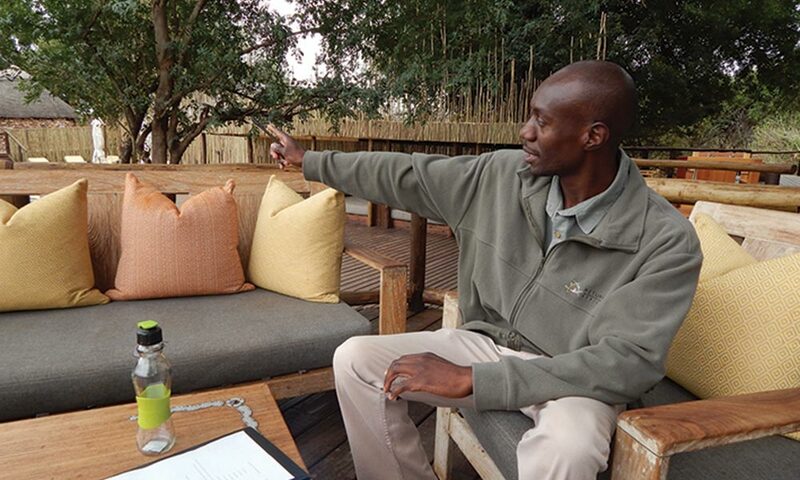 I like an early start to a big trip but work commitments dictated that I could only depart Joburg well after midday so my plan of making it to the RETURNAfrica Camp via the Pafuri Gate – Kruger’s northern-most entrance – before the 6pm closing time, required revising. 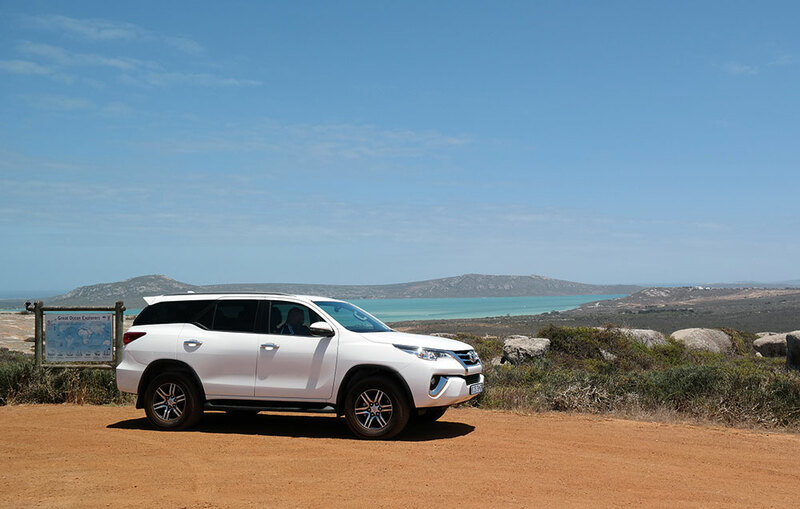 I packed all my usual safari gear into the huge rear loading area of the Nissan Patrol and there was still plenty of space for a few additional nice-to-haves such as two extra jerry cans full of 10ppm diesel and a bag of oranges, without affecting the view through the rear-view mirror. A quick glance at the Patrol’s owner’s manual reassured me that she can handle 500ppm diesel, as this is the only type available in Mozambique. 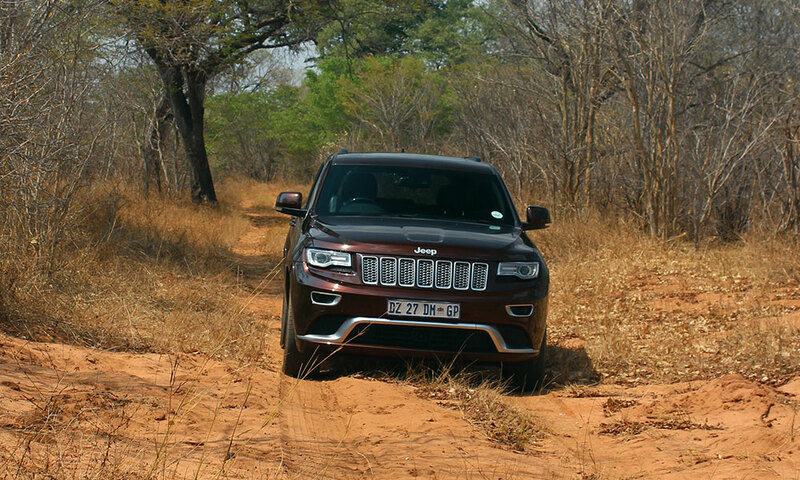 There are various routes to the northernmost part of Kruger Park and I have used them all. When the priority is simply getting there by the easiest and quickest route, I use the N1 north passing Pretoria, Polokwane and Louis Trichardt towards Musina. I turned right just after the Baobab Toll plaza onto the R525 towards Tshipise and Masisi. Note that the bridge over the river at Masisi, which was washed away during the 2001 floods, has not yet been repaired and this route can be blocked during and after heavy rain. 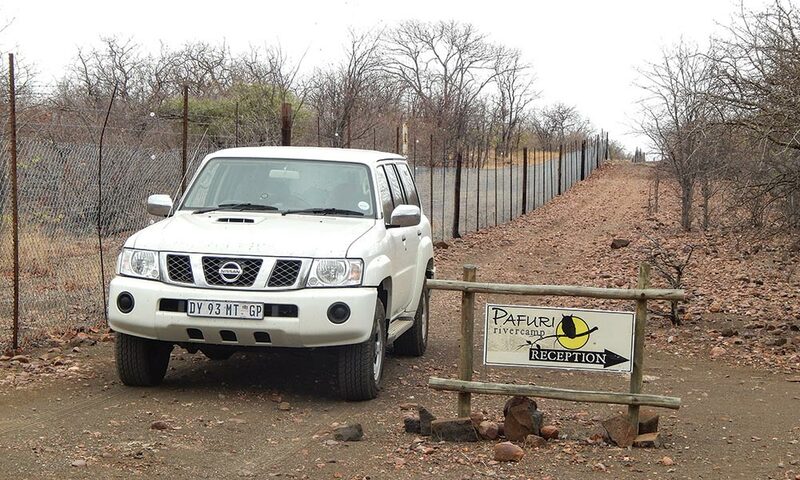 If the northern parts of South Africa have been having good rains, contact Kruger Pafuri Gate before departure as they will know the state of the access roads. It was after 8pm when I pulled up in front of Pafuri Rivercamp’s reception hut. A friendly nightwatchman called Samson Chauke appeared from the darkness and assured me that the boss would come down soon. To me, one of the charms of places off the electricity grid is that lighting is minimal or non-existent and my eyes quickly adjusted, allowing me to spot a tiny Scop’s owl that had been hooting from an overhanging branch. Once I had paid for a site, breakfast and a bundle of wood, manager Martin Erlank showed me to the campsite where I was the only occupant. I chose a prime spot underneath a spreading zebrawood tree on level ground close to the basic, but functional and clean, ablutions. I soaked up the solitude and night sounds by the light of a crackling fire and took a cooling shower before bed as the temperature was still well into the 30s. 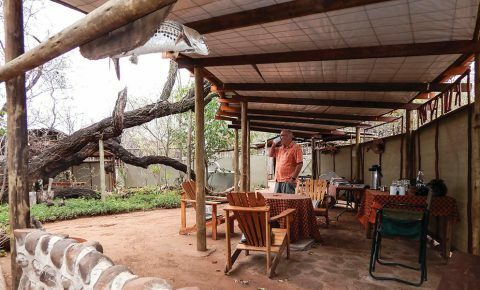 Pafuri Rivercamp has an excellent cook and over breakfast, I chatted to Martin about the folk, fortunes and fables of the Pafuri region. It’s well worth a week in a future trip, but I had a date with a river; the lazy, lovely and lyrical Luvuvhu River. The Limpopo and Luvuvhu rivers form two sides of a triangle with the western boundary of the Kruger Park making up the third. 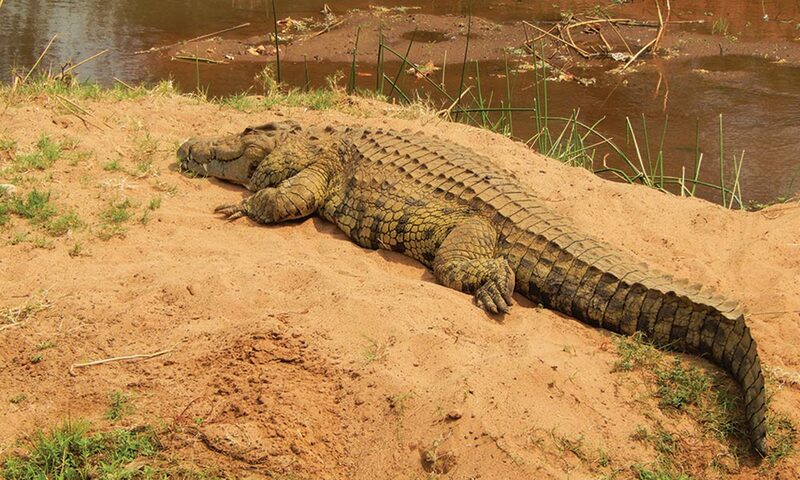 This chunk makes up 1% of the Kruger National Park but hosts 75% of the species. 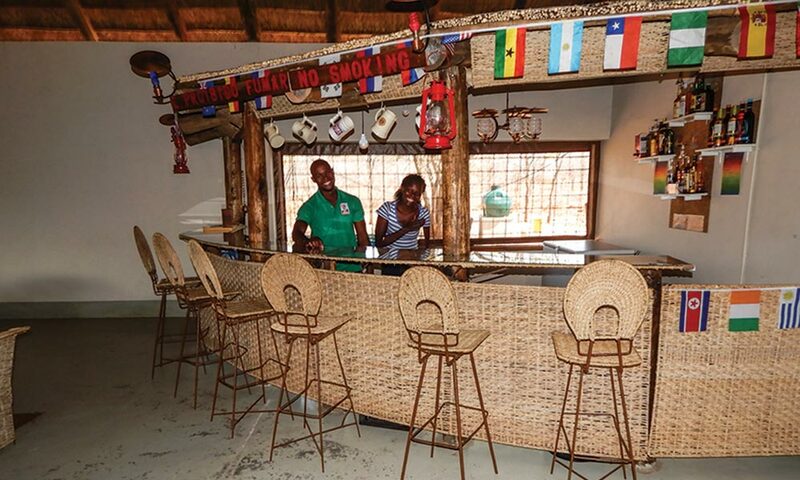 It is also only accessible by staff and guests of concessionaires such as RETURNAfrica. So it was with a sense of smug excitement that at the sign that says ‘strictly residents only’, I turned off the tar just before the Luvuvhu bridge and headed into a part of the Kruger National Park that so many drive past, but few have the privilege of exploring. Just after the turn-off, a RETURNAfrica ranger asked me whether I was booked in. When I parked the Patrol in front of the “Great Zimbabwe” styled stone enclosure that leads to the reception, Enos Mngomezulu, the hospitality manager was there, waiting to greet me. The welcome cocktail and cool damp towel were already enough reason to drive all night to be there. 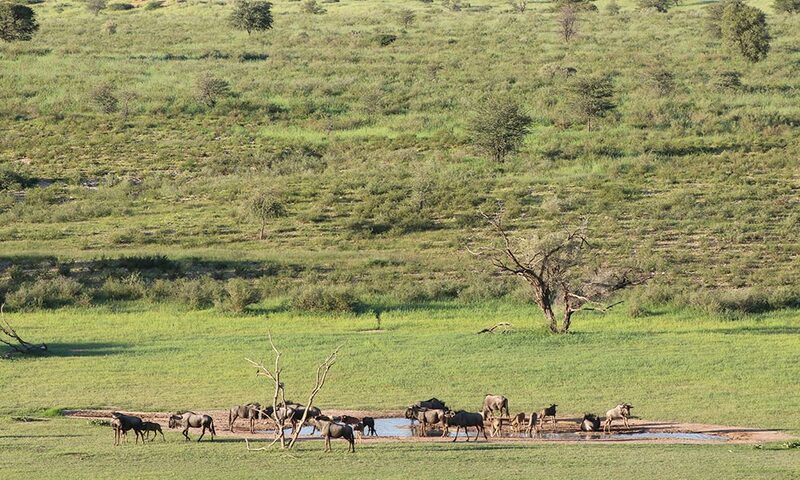 Fortunately, brunch was just being served in the dining area overlooking the river where buffalo, elephant and other game were coming down for a drink. Everywhere overlooks the river. I was able to more than satisfy the inner wolf before being introduced to Wiseman who would be my personal guide for the two-day stay. We climbed into the game-viewing vehicle and headed off to take a look at the two Walking Trails Camps as well as at the Baobab Hill Bush House self-catering family accommodation which was formerly the Section-Ranger’s House. On foot is by far the best way to experience the bush and those rangers of old certainly knew the value of a 360-degree view. Back at the lodge, I took a stroll down the boardwalk to find my bag in a tent spacious enough for a small army and luxurious enough for a pedantic princess. With no other tents in view, and the river bank just metres away from the front veranda, it was easy to imagine that I had a sizeable serving of awesome African wilderness all to myself. After a shower, delicious lunch, swim and a chat with guests and staff, Wiseman and I headed north to the wide, grassy Limpopo floodplain with Zimbabwe’s rusty red sandstone hills in the distance. He pointed out white-backed and lappet-faced vultures spiralling above the scorched plains and I picked up a crowned eagle lifting off from the top of a nearby koppie. With over 350 species of birds and dedicated birding walks, this area is bird-nut’s bliss. Sipping a beer watching a herd of elephant kicking up dust with a hazy red sun sinking behind the hills, I couldn’t help think that money can’t buy things like this. Back at camp, supper was fresh and delicious and Enos joined me for a while and explained how his family had been forcibly moved from the area in the 1960s, while currently the ever-present reality is a continual threat from organised poaching and illegal migrants moving through the concession. The following day I was up before the dawn and sat with coffee and rusks on my veranda smelling, listening and watching as the riverine habitat slowly came to life. At the lounge I found Wiseman waiting and we drove to the spectacular Lanner Gorge on the Luvuvhu River which is 150m deep and 11km long. 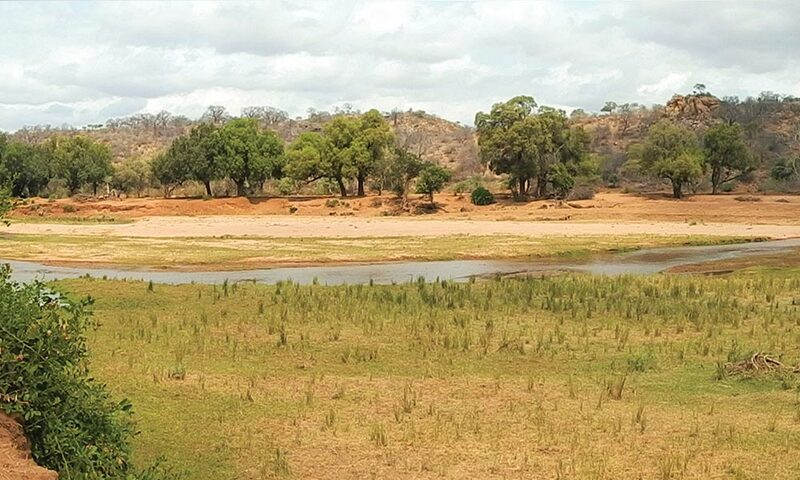 I tried to picture what the tiny trickle of a river must have looked like during the 2013 floods that had destroyed much of the infrastructure in the area and closed the Pafuri Border Post for a year. I had already got this online. 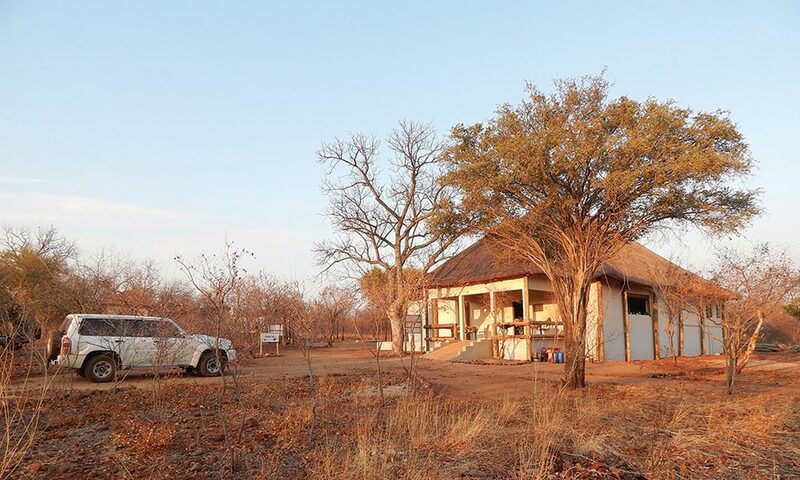 Pafuri village is a row of crumbling colonial houses and a dusty road lined with rusting abandoned cars. I began to expect to be challenged to gunfight by a Clint Eastwood lookalike if I lingered too long. 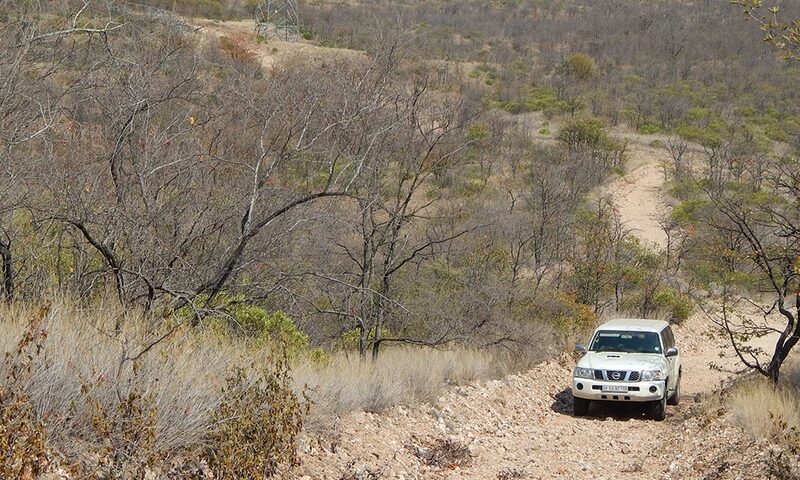 I drove the Patrol up a nearby hill past what had once been Wenela mine-labour recruiting offices to a newly opened community tourism initiative called Crook’s Corner Lodge. Formerly a farmer in the Rutenga district of south-eastern Zimbabwe, Derick Lemmer first transformed the stately old railway station in Chicualacuala into a restaurant and hotel. He has now taken up the challenge of trying to turn this initiative into a profitable business. The architecture may be better suited to an Italian village, but the ensuite rooms are cool and spacious, the food excellent and the beers cold. There is also a camping area with very nice ablutions, but be prepared to fend off very persistent mosquitoes. Get those screens and mosquito nets up and you will have a great place, Mr Lemmer! On my way to Mapai and Machaila, I stopped in at Dumela Wilderness Safaris’ beautiful Pel’s Owl Campsite set among magnificent mahogany trees overlooking a permanent oxbow lake. Missionaries Lourens and Sonja really know the needs of the overland traveller, while fishermen and birders already rate their spot very highly. They also have Gomo (hill) campsites for those who prefer a view. As my next stop was Machaila, just five hours’ drive away, I spent some time exploring the servitude track underneath the Cahora Bassa HVDC powerlines that run for 1 400km between Songo and Pretoria. 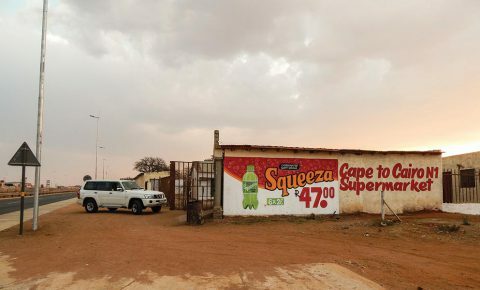 At Mapai petrol station I discovered that diesel prices had just gone up by 25%, but with the favourable exchange rate, it is still good value at around R9 per litre. 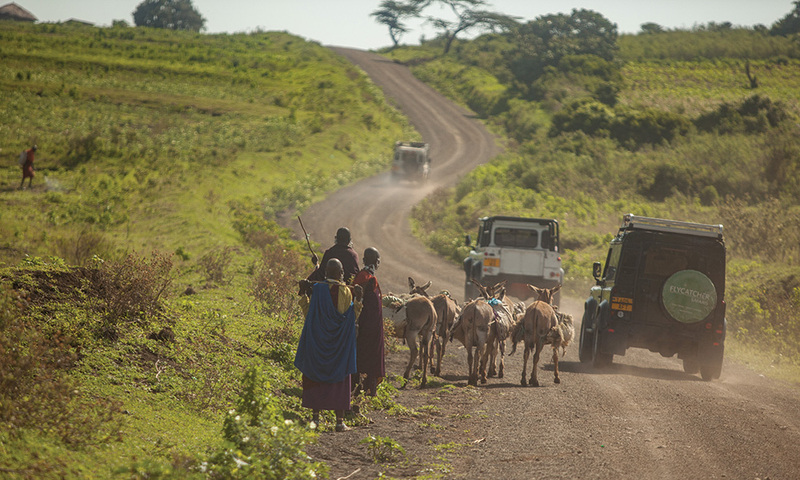 The road between Mapai and Machaila has been extensively upgraded so in dry weather a safe speed is 80km/h and I made it to the community campsite with a few hours of daylight to spare; unusual for me. When first opened, this spot received good reviews, but while there is still apparently someone who sweeps the leaves, there was no water and the recent rains had brought out a cloud of flies. 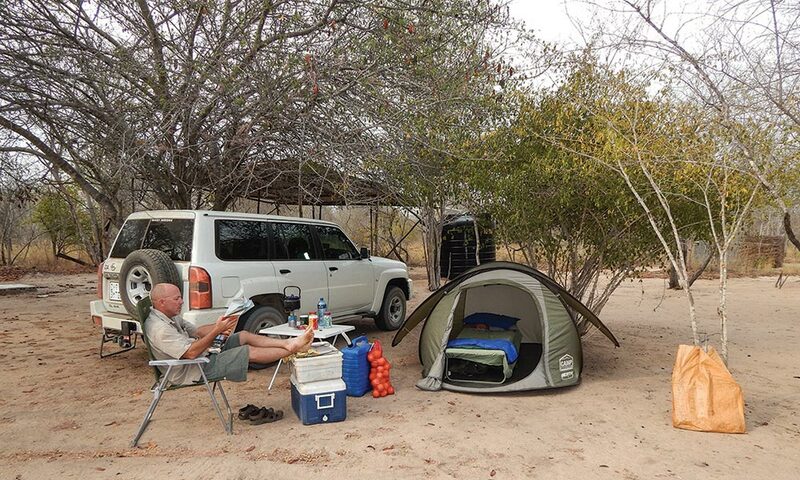 It’s still a good, quiet and safe spot to spend a night between Pafuri and the Mozambique coast, though. Zinave National Park is just two hours (in a capable vehicle such as my Nissan Patrol) north of Machaila, and it is currently the focus of a Peace Parks Foundation game and elephant re-stocking programme. Here you will also find a magnificent failure called Tondo Lodge that never received a guest and could be in the running for an ‘Inappropriate Architecture’ award. At least the safari tents had comfortable beds and clean linen and the nearby ablutions were clean with plenty of hot and cold water. The view over the sandbanks and channels of the Save River was some-thing timeless. I chatted to one of the new managers in charge of providing security for the newly arrived elephants and antelope and he explained that the plan was to cater to independent overland travellers such as myself, and that already Zinave was becoming popular with birding groups. I had entered at the western gate to Zinave and left via the river route which are both official, but uncontrolled, routes and so I paid my entrance and accommodation fees at the Covane headquarters which is 4km from Tondo Lodge. 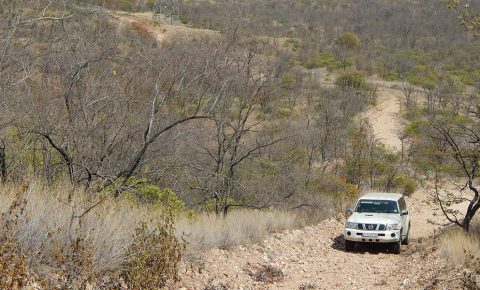 The Mozambique government and SASOL have been up-grading roads extensively east of Zinave and, while it was very slow and overgrown in the Park, once outside I enjoyed having the road to myself in a vehicle tailormade for this kind of road. It was great to arrive at Inhassoro, still one of the nicest towns on the entire east African coastline, with enough time to revisit favourite people and places and at Estrela Do Mar to enjoy a plate of lulas grelhadas (grilled calamari), my favourite Mozambican dish. South Africans don’t need a visa for Mozambique. 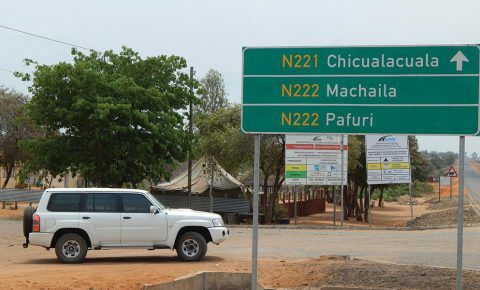 For other countries, visas are issued at Pafuri border for R800. You need the original vehicle registration document or a certified copy. 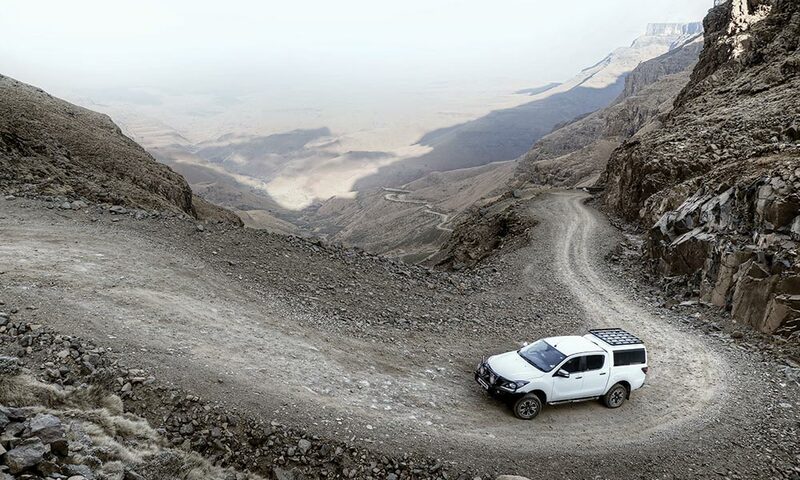 If the vehicle is financed, get a cross-border letter from your bank and proof of insurance. If not your vehicle, get a letter of permission with all your details including passport number, dates of entry and exit and route. The duty-free allowance for groceries is 5 000 meticais (R900 at the time of writing) per person including minors, so keep your receipts. No beer may be imported. The rapid decline in the value of the metical has made Mozambique a fairly cheap destination at present. You will get between Mzn5 and Mzn6 for your rand. The best way to get Mozambican meticais is by using your Visa or Mastercard credit or debit card at an ATM in Mozambique.